Ripping is not as satisfying as knitting: Meribel but this time not in France. Pattern ML181 Love this Cardigan Ravelry.com. Meribel’s great to work with , it’s soft, it grows quickly on big needles, it sheds a little but not too much. I made the first front in speedy time. I began the second front. 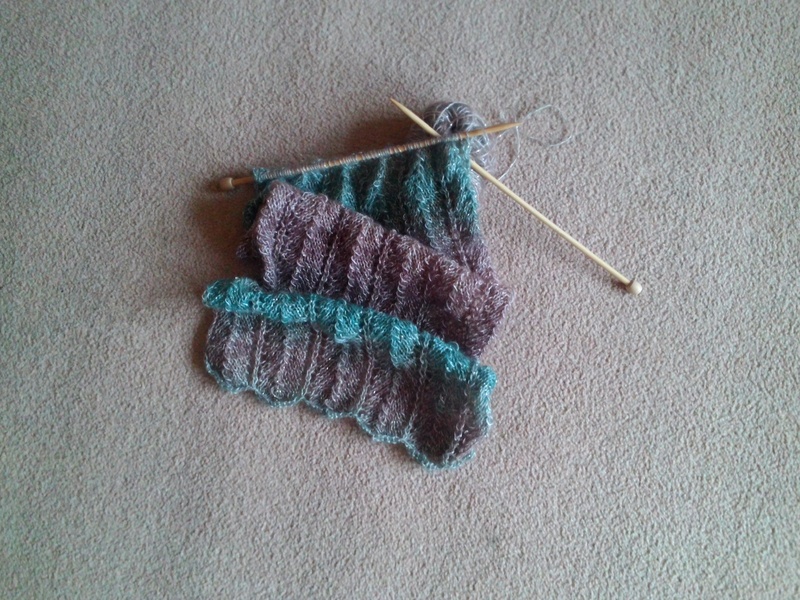 I usually compare the two as I go along, especially when there are colour changes or shaping – but I didn’t this time. (Why?? I can’t actually answer that!) I measured the two against each other only when I reached the armhole shaping and realised I’d not done enough stripes on piece two (how did I miscount when the stripes are in bands of 2? I know my 2 x tables!) and the pocket was placed too low down. Duh! So I had to rip down a couple of hours of work, undoing this slightly fluffy yarn whose fibres cling to each other, and started reknitting, surrounded by teal fluff. We knitters know ripping is quicker than knitting! Ripping is satisfying to me only if it doesn’t mean it’s a current mistake than needs fixing quickly. I really want to finish this cardigan to wear this season and I have so many WIPs that this was a little ‘treat’ to myself. Dare I carry on today for a while or do I need to switch to a much more pressing time restrained project (eg. a friend’s baby may arrive soon and he/she needs something to wear much more than I need to add to my own wardrobe)? I guess my knitting time today will be shared between the two. Here’s how far I got to last night, pocket back in, stripes of the right number. Bye for now. Got to go, got to knit! This entry was posted in Uncategorized and tagged France, knit, knitting, Meribel, Ravelry.com, ripping, Schoeller and Stahl, WIP.